National Precast Concrete Association / Why Precast? But don’t just take our word for it – contact a local precaster today. Want an insider’s look at the precast concrete industry? Step inside the offices and production facilities of three precast concrete plants. Hear from owners, managers and production employees and see how product is manufactured from start to finish. Visit Southern California, Wisconsin and Upstate New York right from the comfort of your seat! How many uses does precast concrete have? Find out for yourself by looking at the renderings of an office park and home below. Road noise is an issue for communities living along highways, but it doesn’t have to be. Precast concrete sound walls reduce the perceived noise by as much as half, while absorptive treatments have been found to further reduce noise pollution. Whether you’re designing or building commercial, business or residential, precast concrete light pole bases are your go-to solution. 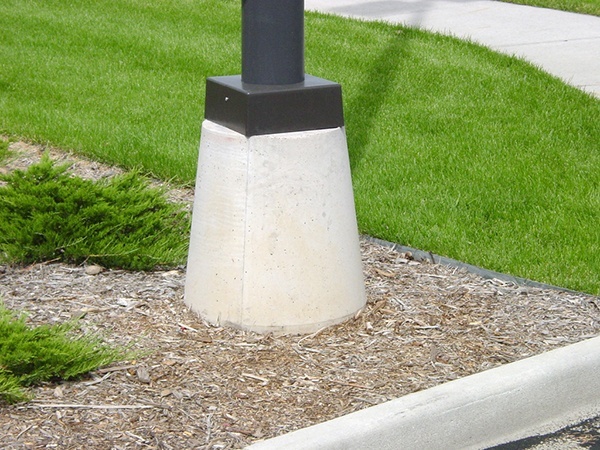 Precast concrete light pole bases are durable, easy to install and manufactured locally across the country. Precast concrete pavement systems can be designed for horizontal curves, three-dimensional surfaces, intersections, changing crown lines and much more. Jointed slabs may be used singularly for isolated repairs or in multiples, to create a continuous surface of new pavement. When heavy rainfall overwhelms a stormwater system, precast concrete underground stormwater systems are used to hold the water for delayed release (detention) or for beneficial reuse (retention). Precast concrete stormwater products withstand not only the volumes of water flowing inside them, but extreme loading conditions on the outside as well. No matter what your design needs are for a building project, precast concrete products are your answer. Precast building products include, but are not limited to: architectural and structural wall panels, lintels/sills, modular pavers, planters, hollowcore flooring, security bollards, structural columns, stairs and a variety of residential products. Whether you want to replace a deficient structure, span a roadway or water, or create a tunnel, precast concrete bridge components provide the perfect solution. Designs include attractive single-piece arches, functional two-piece arches, conventionally reinforced flat bridges, parapets, wingwalls, headwalls and endwalls. Available in a wide array of shapes and sizes, precast concrete erosion control pavers are a sustainable and resilient addition to any project. Precast concrete bases allow windmill towers to reach higher into the sky, where steadier winds capable of higher energy output can be found. As a result, many companies across the world are now manufacturing their windmills with precast concrete bases. Precast concrete grease interceptors remove fats, oils and greases from the waste stream and bring the water to acceptable effluent standards before discharging it into a sanitary sewer system. Grease interceptors are easy to maintain and large enough to hold considerable amounts of waste. Precast concrete manufacturers produce a wide range of engineered earth retaining systems designed to provide a straightforward and cost-effective solution for your next project. Issues with wall height, right-of-way, seismic activity, drainage, quality control and aesthetics can all be overcome with a precast concrete earth retaining system. When constructing a parking garage, precast concrete products are the building material of choice thanks to their durability, economy and ease of installation. Precast concrete products used in parking garages include, but are not limited to: architectural veneer, stairs, structural columns, double tees, paving slabs and traffic barriers. Precast concrete manholes are an integral component of any modern sewer system. A properly designed and installed precast concrete manhole system provides superior watertight performance and will provide the long-term solution you need. Reinforced concrete pipe is instrumental in protecting groundwater by conveying wastewater and stormwater through complex underground infrastructure systems. You may not see it working, but precast concrete pipe plays a major role in preserving groundwater quality and ensuring a sanitary environment. Precast concrete fences are a durable, long-lasting alternative to traditional fence materials. They can be customized with a variety of finishes and colors to match any aesthetic and install quickly. Precast concrete paving products create beautiful spaces inside and out – in homes, commercial buildings and public spaces. Products include: interlocking pavers, paving stones, permeable pavers, roof slabs and a variety of other modular paving systems and products. Quality precast concrete tanks are designed to be sound, watertight, and withstand loads that other materials cannot bear. A routinely serviced septic tank or related on-site wastewater system component will provide many decades of trouble-free service. The precast concrete industry manufactures many products that can be used in residential construction, including front steps, railings, sills and lintels, basement entries, window wells, wall panels, outdoor pavers and molding. Precast concrete products can be used in nearly every room of your house. Whether it’s tile, countertops and sinks for your kitchen or bathroom; a fireplace surround; stairs; or hollowcore, precast is the product of choice. A precast concrete basement entry and foundation will ensure your home is strong and secure. In addition, basement is an excellent location for a saferoom and no saferoom is stronger than one made of precast. Precast concrete pavers, firepits, planters, tables and more make patios a backyard destination. Every year, the potential looms for a natural disaster involving extreme wind events. When severe weather threatens, a structurally sound precast concrete safe room provides life-saving protection. Precast concrete manufacturers produce a wide range of engineered earth retaining systems designed to provide a straightforward and cost-effective solution. They include mechanically stabilized earth (MSE) face panels, large precast modular blocks (PMB), segmental retaining wall (SRW) products, cantilever walls, crib walls and post-and-panel systems. Precast concrete roof tiles and railings are a durable and attractive addition to your home that will stand the test of time. Precast concrete wall panels and veneer provide aesthetics, affordability, durability, strength and speed of installation. Insulated precast sandwich wall panels are a quick, environmentally friendly alternative to energy efficient building envelopes. Precast wall panel finishes range from thin brick veneer to cladding inspired by limestone, travertine and other stone products. Available in a wide array of colors, shapes, sizes and textures, modular paving products create beautiful spaces. These versatile precast concrete pieces can be designed to mimic natural building materials and also to allow the natural percolation of stormwater.